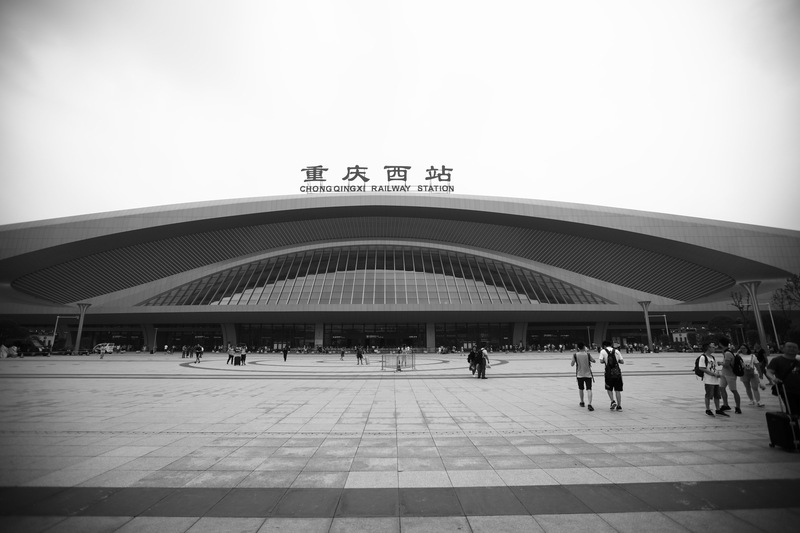 In the morning we took the high-speed train from Chengdu to Chongqing where our shuttlebus already waited for us. The train ride itself was quite an experience itself. We passed the breathtaking landscape and the suburbs with nearly 300 km/h. After 2.5 hours we arrived in Chongqing, where it immediately became clear how huge the city must be. 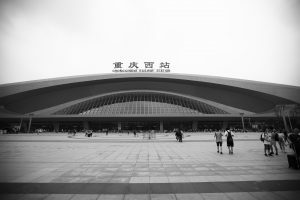 The train station looked more than a giant airport than an ordinary train station. Yasmeen-YunXia Liu, our contact from ABB China, made a perfect figure as a host. With her guidance we were able to find an absolute perfect restaurant for lunch. We ate a lot of different delicious traditional dishes. Everybody was happy to have had such a great lunch before our visit at ABB. 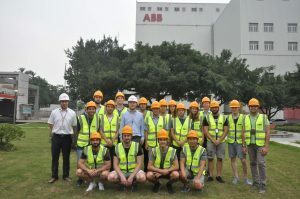 Thankfully, Kurt Lötscher Head Group Public Affairs at ABB opened us the opportunity to visit the ABB factory Plant on the 6th July. ABB’s history dates back to 1891 when Charles E. Brown and Walter Boveri founded BBC, a swiss group of electrical companies, producing motors, generators, steam turbines and transformers. BBC became ABB in 1988 through a merger with Swedish Allmänna Svenska Elektriska Aktiebolaget (ASEA). ABB operates in over 100 countries and decided in 1998 to open a transformer factory in Chongqing. The joint venture grew really fast and started selling its products all over the world. Nowadays ABB Chongqing Transformers Co. Ltd. delivers its transformers mainly to south east asia and its home market china. 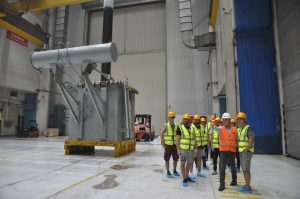 Since each transformer is a unique product and set up to the demands of the customers, the process from order and design to assembly and shipping is highly labor intensive and takes about 5 months. 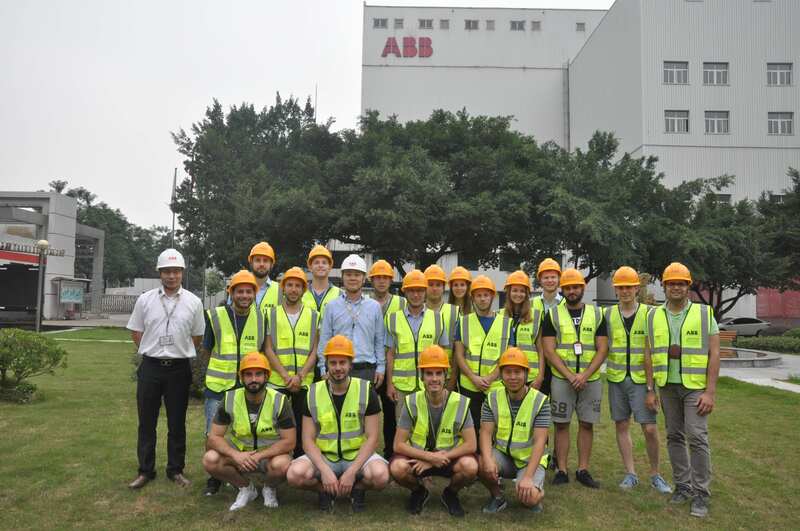 ABB Chongqing counts 557 employees. 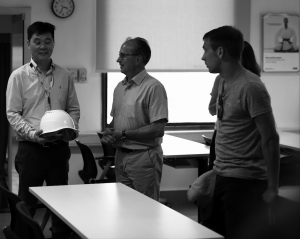 After a short safety instruction, the general Manager himself, John-Hanping Zheng, held a presentation about ABB Chongqing Transformers Co. Ltd. where the USP’s, market demands and latest changes in terms of technology and competitors were discussed. Many questions were raised by the audience. Equipped with the necessary helmets and vests, we walked through the enormous production halls and saw the before learned facts live in form of the giant transformers and generators which are capable of serving few hundred thousand and some even up to several million people. After the breathtaking tour through the production site, we went back by bus to the city. Where each province has its specialties so does Chongqing have its famous hotpots. With some help of locals, we were able to reserve a hotpot dinner at tiny hotpot specialized restaurant. First It reminds at a classic Chinese fondue which is well known to be eaten at New Year’s Eve in Switzerland. Nevertheless, the hotpot was quite different. The additional ingredients as well as the unknown herbs made the dinner a perfect end of the official day. Chongqing itself, as above mentioned, is a city of unimaginable size and flow. The following pictures will give an impression why Chongqing is called the little Manhattan. Surely, a few of us will return to spend a few more days in Chongqing. This entry was posted in SML Emerging Markets Field Trip 2018 by anderma1. Bookmark the permalink.